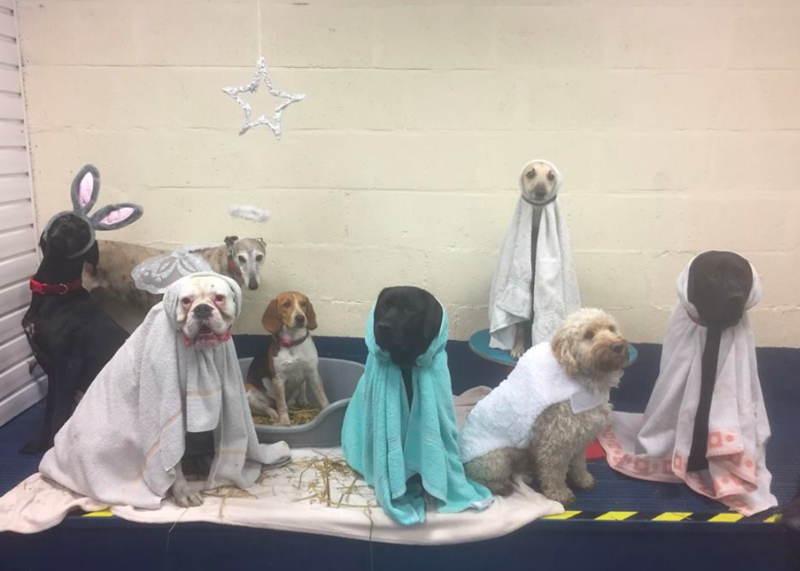 A group of dogs at a day care centre posed as the Nativity scene and it’s definitely the best recreation you’ll have ever seen. As I’m sure we all know from school plays, there were a few different animals present at the Nativity. 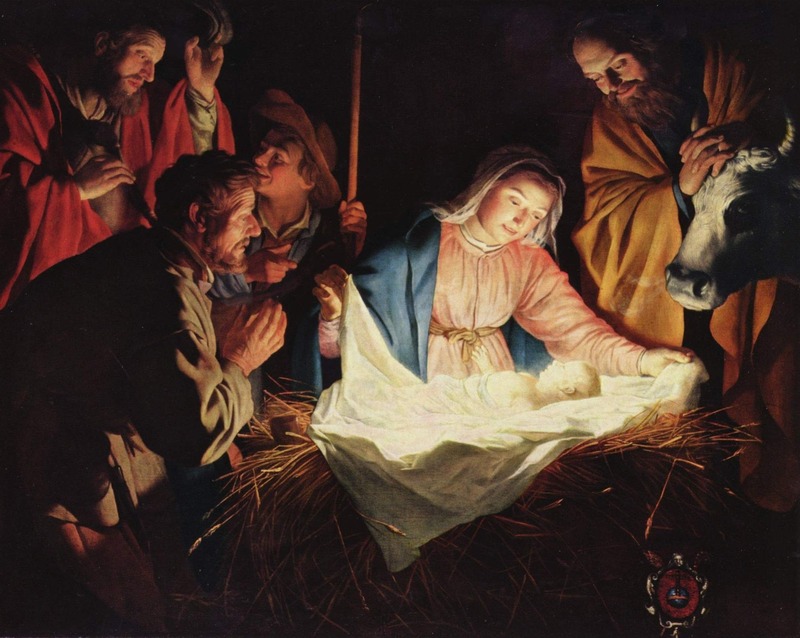 While there almost definitely wasn’t a lobster or an octopus as Love Actually might have us believe, the story goes that an ox and a donkey were around for the birth of Jesus. Unfortunately there seemed to be a distinct lack of dogs around at the time, but staff at Springvale Canine Creche in Rotherham soon righted that wrong. Springvale is a doggy day care centre where adorable pups can go and hang out with their other four legged friends for the day while their owners are at work. When the Christmas season approached, staff at the creche saw an opportunity they couldn’t pass up, so they gathered some towels, an angel halo and a dog basket and got to work. The brilliance of the end result could quite possibly outweigh all of your Christmas presents put together. This image gets funnier each time you look at it. There’s so many elements which make it great, and I’m very impressed the canines were all obedient enough to pose for the photo while keeping their costumes on. Some of them admittedly looked happier than others with their character – the black dog on the left, whose name is Frank, couldn’t be prouder to show off his new ears. While they might look like bunny ears, he’s actually representing the Christmas donkey. 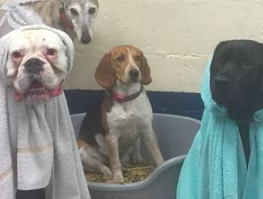 As for Reuben, the beagle who has been given the role of Jesus, he just looks like he’s silently judging the whole escapade with his side-eye. The fluffy white pup at the front, named Olly, makes an excellent sheep, but the shining star has to be the forlorn-looking whippet raised up at the back. That good doggo is Sammy, and while he fits well into his ‘wise man’ character, his face says ‘no amount of treats is worth this’. Donna Whincup, the owner of Springvale Canine Creche, spoke to The Dodo about how the excellent photo came to be. With it being Christmas we decided to create our very own Nativity. The dogs all enjoy working for treats, so we get them to sit or stand and stay. 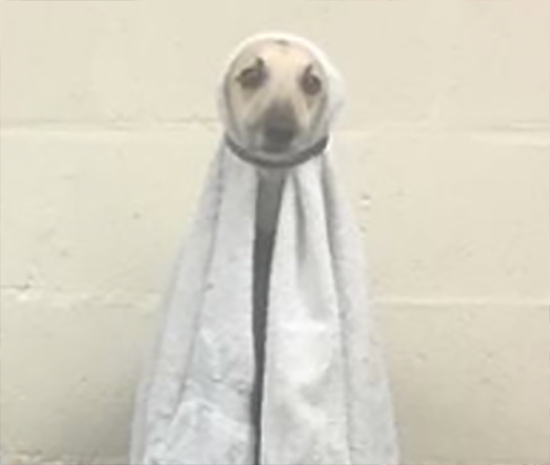 Of course, the staff at Springvale do more than just dress their dogs up as religious figures. 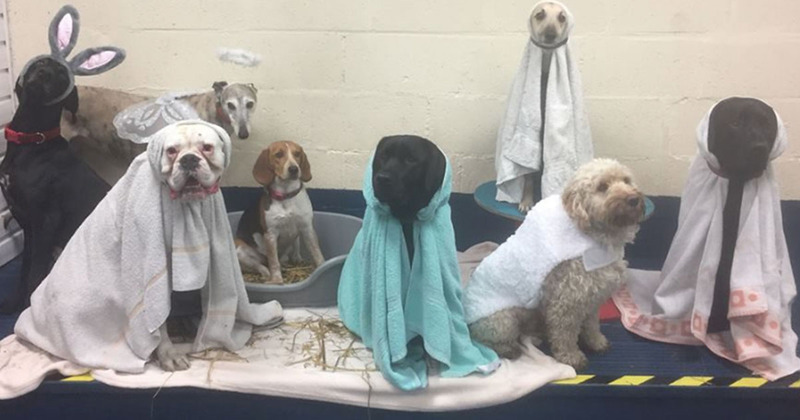 The lovely puppers who get to spend their days there are trained by the workers, and I think the Nativity photo safely proves they’re very good at doing what they’re told. As well as recreating the story of Jesus’ birth, festivities at the daycare have included Christmas jumper day, where the animals dressed in their finest Christmassy garments, and even a game of ‘catch the snowman piñata’. I think the dogs are well and truly ready for Christmas after all of those activities!